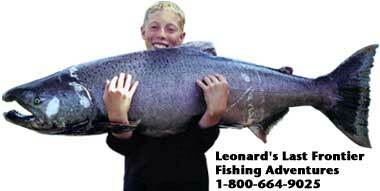 If you love to fish, you'll have the trip of a lifetime with Leonard's Last Frontier Fishing Adventures. Everything you need for the fishing is provided: the specialized boats, rods, reels, lines and lures, and of course an expert knowledgeable guide. (All you need to bring is yourself dressed in layered clothing, wet weather gear, and don't forget your camera.) We love to talk about fishing on the Kenai Peninsula so if you have any questions about fishing, lodging or other information about Alaska, please give us a call. We can help personalize your trip according to the type of fishing you enjoy and the time of year you would like to come. Book early to ensure the dates that you would like.